I am in France with my family for a few days and following the same reassuringly predictable and relaxing schedule I have described in the past. I have been spending more time than usual with my brother however as he off work at the moment and most days have included games of squash, cross-country cycling with Dad and cooking with Mum. We made a day trip to my parents' country house to enjoy the fresh mountain air and to go for a long walk in the woods surrounding their property. No walks in my family is without purpose however and ours was to pick wild mushrooms (specifically a vibrant yellow variety known as "chanterelles") which, as surprising as it may sound, is one of my favourite things to do in the world ... yes, as high up the list as drinking cocktails on rooftop bars! 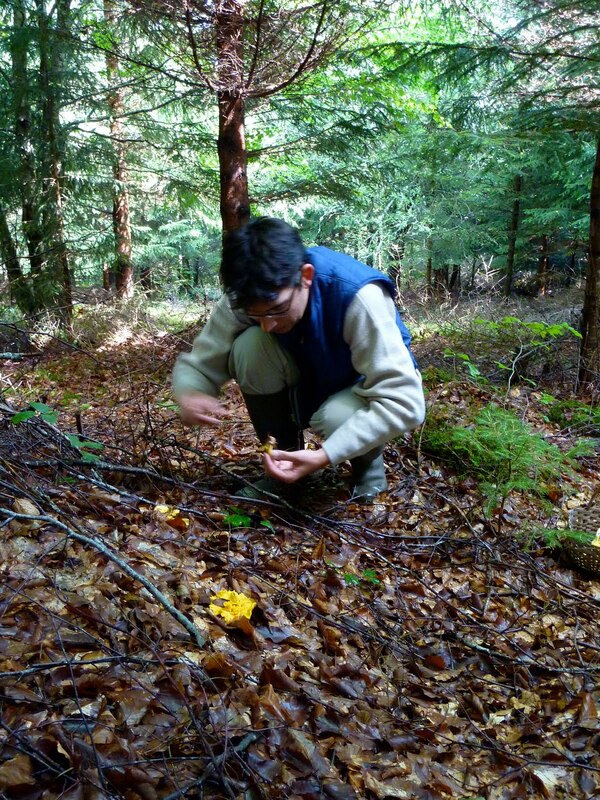 Mushrooms tend to grow in the same areas over and over again and therefore the first rule of mushroom hunting (and second and third) is to never divulge your best picking spots. My parents for example would never tell their friends or even their siblings where their spots are and in fact, Mum and Dad themselves don't even know all of each other's hunting grounds as they tend to split up when going mushroom picking and only meet up later, each smiling widely and carrying a wicker basket brimming with delicate and aromatic fungi. There is something very eerie but also incredibly freeing about being in the middle of a forest and not knowing where you are, which way you came from and more importantly, how to get home. Thankfully my parents seem to be equipped with an almost alien sense of spacial awareness and can not only find their way back very easily (thankfully, as neither of them carry a mobile phone!) but can also tell exactly where they are, even down to the actual ownership of the plot we are standing in! My Dad's family owns several acres of forest in the area as it was customary for my grand-father to buy plots for his children and grand-children. I guess that for his generation it represented the safest and most long lasting form of financial investment. I must admit that I do always get a tinge of pride when, after having apparently crossed some kind of invisible boundary lines, my Mum or Dad casually drop in that we are now on my very own piece of land. From country-side lover to stereotypical New York City girl, I realise that I am describing two different lifestyles that should in theory not co-exist very happily together. But I have come to terms a long time ago with the fact that they are both "me" and that I would never truly be able to appreciate one if I didn't also have the other. On the contrary, I think your 'two lives' compliment each other and bring balance to you. Your French life sounds totally idyllic, I want to pack my bags and leave for France right now! Mushroom picking on the farm I grew up on was one of my favourite things to do too. Though we only really found field mushrooms and toadstools. We'd take them home and my dad would cook them with a bit of flour and water making a slightly thick black sauce. We would eat the concoction on toast. It sounds and looks very average but in fact, its one of the best ways to eat mushrooms. Their flavour speaks for itself.